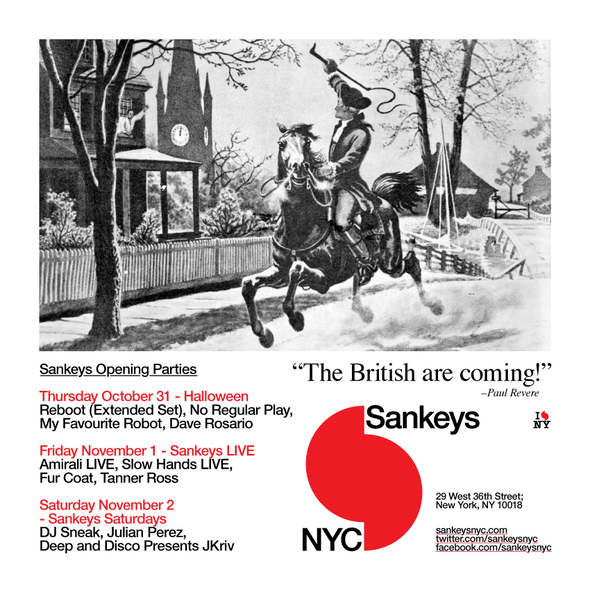 As Sankeys Ibiza’s third season draws to a close, their attention is now turning to New York as the club’s long-awaited opening is realised with the theme "The British are Coming". Housed on 29 West and 36th Street within the heart of Manhattan, Sankeys NYC accommodates a brand new Void Incubus sound system and features the world’s first hydraulic LED Grid Matrix system. The venue has two rooms, the futuristically themed Basement and the European influenced low ceiling Spektrum, will provide great scope for programming each space.As anyone that has visited Sankeys in Manchester or Ibiza will know, New York’s club scene has been at the forefront of global inspiration and captured the essence of legendary old school basement nightclubs like the Paradise Garage, Sound Factory and Vinyl from the 'city that never sleeps'. New York will be a showcase for up and coming and breakthrough artists, many of whom have led a charge of fresh musical energy during this year’s Ibizan season as well as featuring leading names from around the world. Establishing a family of collaborators, label showcases, underground promoters and DJ collectives has created a global feel to Sankeys, and travelling to New York is a long held dream for its founder, David Vincent. “Working alongside the same team (Antonio Piacquadio, Paolo Angelo and Rob Toma) that helped me make Sankeys Ibiza become another world-respected nightclub, I am very much looking forward to creating a new nightclub for New York. I have always wanted to live and open a club in my favourite city in the world since I went to Vinyl to see Danny Tenaglia in the early 2000s.